...Most sausage making recipes require that you use some type of a casing to hold your ground and seasoned meat. As with meat grinders, you have some choices when it comes to sausage stuffers. The small manual models have been around for a long time, don't cost a lot, and are mostly bullet proof (they can be a bit slow though). Larger manual stuffers are great machines, but I haven't found many of them on the used market. Hydraulic and electric stuffers are other options, but you'll pay more and they're often geared to large scale operations. You may not even need a dedicated stuffer, depending on the kind of sausage grinder you are using. A small manual stuffer is usually made from cast iron or aluminum or from stainless steel. It is operated by a plunger system like the example to the right. There will be several sizes of stuffing tubes that attach to the front of the machined and those are usually made of food grade plastic or stainless steel. This kind of stuffer will typically handle about 3 lbs. of sausage at a time. I've found used ones for under $10. You can buy a new one online for around $50. ...can load as much as 15 to 50 lbs. of sausage at once. They are usually made from stainless steel and are operated by a hand-cranked piston. These are a great investment if you plan to make a lot of sausage at one time...but expect to pay from $175 to $400 for a new one. This is the kind of sausage stuffer we used in our communal venison sausage kitchen. The huge capacity electric, hydraulic , or vacuum operated stuffers are sometimes known as sausage linkers. They will produce hundreds of lbs. of sausage an hour, and are used only in commercial or industrial sausage kitchens. The investment for one of these machines will be in the thousands of dollars. Before you rush out and purchase a dedicated sausage stuffer, take a look at the meat grinder that you plan to use. Most grinders have optional stuffing attachments that will work almost as well as a stand-alone model. They may be slightly slower, but will reduce your equipment investment by quite a lot. 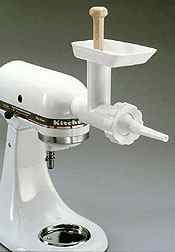 Here is a picture of a stuffer like I use on my stand mixer/ grinder. Almost all electric grinders and most hand grinders will have available tubes or attachments that will take care of your stuffing chores. You only need to remove the grinding plate, attach the right sized stuffing tube, and start linking sausage. When you purchase a dedicated sausage stuffer or a stuffing attachment for your grinder, make sure you get several sizes of stuffing tubes. You'll need the smallest for breakfast sausage and franks etc, the medium sized tubes for Polish style links, and the larger for bologna and summer sausage sized products.